I must say, I'm very pleased by the handwringing over the US space program that is taking place as the last Space Shuttle (Atlantis) has launched and everyone is beginning to realize that there will be no more Shuttle flights ever again. My opinion on the Space Shuttle is mostly along the lines of this post, that it could have been a good thing if done right but in the end it ended up being an expensive and very infrequent means of getting to space. At the end of the day though, what may be more important than the freeing up of dollars for other programs is the emotional impact of the Shuttle's end. Not only are Shuttle launches themselves always worth the watch, but in spite of the fact that SpaceX seems to be well on track to give the US the ability to send people to space again very soon, the end of the Shuttle is being treated like the end of the US space program itself. This is not the least bit true, but all the handwringing taking place at the moment has one large benefit: it is bringing the discussion of what sort of role the US should play in space to the fore again. In short, it's scary to be without manned access to space while nations like Russia and China have it - even if Russia has no problem sending crew and materials to the ISS and back. Being scared of being left behind by another nation was a big part of the Space Race, and as long as this fear isn't overblown it can be a good thing. Far better than complacency. Here are some examples of what is being talked about at the moment. After Atlantis, what's left in space? 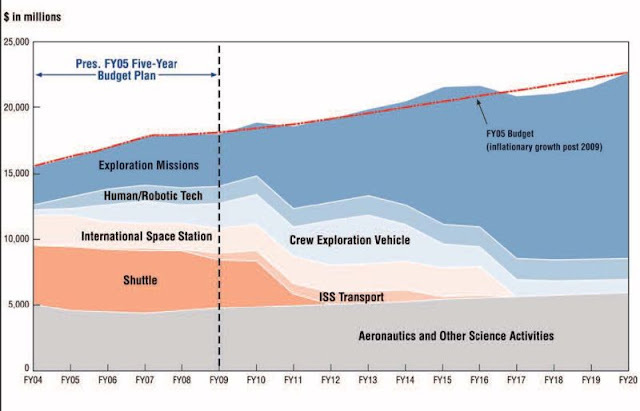 What's next for U.S. space program? Keep it up, handwringers! Once the Shuttle returns and no Space Shuttle will ever reach space again we may get to see even more of it.